Bumpy, winding roads and a flapping toilet door: these are the mildly nauseating highlights of a midnight bus journey from Hanoi to Sapa, a remote mountain town in north Vietnam. Somehow, during those twelve hours of excitement and muffled laughter with my companions, we are lulled to sleep. When I open my eyes, it’s already morning. Dawn is creeping into the sky. Teal mountains yawn in the distance above fields of mossy green; thick clouds of silver fog snake across the landscape, misting the window. Karen and Dom are both still fast asleep, mouths slightly open, breathing deeply. I pull my hoodie back over my head to catch another wink of sleep, slipping quickly back into dreams of winding roads and misty mountains. We reach Sapa before noon, our bus surrounded by a huddle of small tribeswomen. Wicker baskets are slung across their petite backs; colourful bandanas wrap around their heads. They’re charming, but feisty, peddling souvenirs and hotels with eager zest. Sharing sleepy smiles, we make our way to the town. Everything is cloudy, eerie, cool; I zip my hoodie up to my throat. It’s impossible to see past the fog. Wind whistles in our ears as we walk in parallel to ghostly Sapa Lake. We quietly remark upon the chilly breeze, the atmospheric presence of the mountains, the complete lack of other people around. It begins to drizzle. I feel dazed, like I’m still dreaming. Damp and hungry, we reach the main street, where neon signs touting Vietnamese coffee and vacant rooms pierce the foggy air with colour. Tonight, we’re sleeping at a local homestay in Ta Phin village. Our host is Ms. May Kieu, of the Red Dao Hilltribe, who we'll be meeting at a local restaurant, Le Gecko. The warm ambience at Le Gecko is a welcome respite from the cool rain. The delicious food revives us: melt-in-your-mouth spring rolls; steaming bowls of fresh chicken pho; special fried mountain rice; nutritious mango lassis. Heavenly glasses of sweet, hot cà phê sữa đá - brewed Vietnamese coffee with condensed milk - warm our shivering bodies and jolt us awake before our two-hour walk to the village. Ms. May Kieu arrives on a bright red motorbike. She's decked out in traditional clothes, a biking helmet, and a pair of muddy boots. "Stay and enjoy your lunch,” she tells us, after shaking our hands. “My cousin, Pham, will take you to my house later.” She hauls all three of our backpacks deftly onto her bike and speeds away into the fog. Pham, who collects us a little later on, has beautiful cheekbones and kind, smiling eyes. As we walk, we ask Pham about life in Sapa, about her family’s history. Her English is strong. She points out various tribes in each village, distinguished by their different clothing, and asks about our own lives. “What is life like in London?” she asks. I reply honestly: “Cold, crowded, busy. Beautiful. London people can be very rude. You're much nicer!" Pham giggles at this, hand over mouth, her earrings quivering. We begin to walk up a long, sloping path. At the end of the path, we halt in shock. “Are you kidding me?” Karen cries out, staring at the postcard perfection before us. The scenery is absolutely staggering. Enormous vistas of apple green, moss blue, mud brown, burnt sienna; the colours bleed into one another like watercolour brushstrokes. Save for the occasional piece of coloured plastic litter, the rice terraces look like a pristine alien landscape on another planet; love letters to the universe etched in the soil. Pham, well used to the view, skips nonchalantly ahead. We, however, have stopped dead in our tracks, speechless. Views of the glimmering green rice terraces clear away all hectic thoughts of the city. Crisp mountain air scoops every polluted breath from our lungs, filling us with peace. Mountain life unfolds around us as we stroll. Locals zoom back on forth on mopeds, some carrying foreigners, others carrying crops. Majestic herds of water buffalo eye us with alarm, their velvet fur rippling with suspicion at foreigners. Dominique, the happy photographer, stumbles across two beautiful kids standing on a nearby terrace. Sapa is a revelation to us city kids. We reach Ta Phin village by sundown. May Kieu’s house is a large concrete barn, significantly more developed than other nearby homes. May Kieu’s mother is small and robust, and May Kieu’s husband, Phan Quay Lua, is already cooking dinner at the fireplace. Three kids zoom around the house, playing with yoyos and cartwheeling across the floor. Dinner is delicious, a generous array of local dishes: meat dishes, stewed vegetables, sauteed potatoes. May Kieu pours us homemade rice wine. “Welcome to Sapa and to our home,” May Kieu toasts us, raising her cup. “Have a good time here and come back soon." I sip the rice wine. It’s potent. May Kieu’s mother keeps refilling our cups. Soon, a pleasant warmness has spread through our bodies. After dinner, May Kieu runs us a rustic herbal bath in three giant wooden tubs. We strip down and sink into the boiling water, a perfect antidote to post-trek muscle ache. Rice wine and steam mingles with our sleep deprivation, making us dizzy and giggly. When a spider begins loitering on the wall above Karen's tub, she immediately clambers out, and we decide it's time to dry off. Our beds are rudimentary: two foam blocks on a wooden frame with a mosquito net and sheets. The window is a jagged open square in the wall. We crawl under the blankets, exhausted, sharing one bed between the three of us. Weirdly, we can’t sleep, a mixture of jetlag, discomfort, and excitement. We talk for hours in the darkness about relationships, life, and aspirations, before finally falling asleep. In the morning, we wake up to roosters crowing, dogs barking, and birds chirping. Mountain music. The smell of coffee lures us out of our bedroom. Lua has whipped up an enormous stack of warm crepes, bananas, coffee, and local honey for breakfast. We devour the crepes, compensating for our lack of sleep. After breakfast, full of energy and caffeine, Lua takes us on a hike around the area. We hike upwards, herds of water buffalo passing by, towards Lua's hidden vantage point. “Too foggy to see whole area,” says Lua. “But we wait, and you will see.” So we sit, and we wait. Opaque white mist teases us, giving us glimpses of green and yellow. But suddenly, for the briefest of moments, it clears away, revealing a dazzling vista of infinite rice terraces below and beyond. Lua takes us down mountains, across rice fields, past schools and villages, through valleys and rivers. Soon, we reach a burbling stream, deceptively deep, filled with rocks. Lua is a gentleman. He wades in and wedges rocks into the water for us to use as stepping-stones. He holds out his hand, helps me across first. I clear the river, hopping off the final rock onto the marshy bank. Karen, however, loses her footing on the first rock and plops into the stream. We cry with laughter. Oh, Karen! Lua stifles a chuckle as he kindly helps Karen up and across. Dom, gymnast of the group, makes it across without a hitch. Karen takes a few minutes to lament her dripping shoes. We move slowly through the rice fields, balancing carefully between sections. Karen's long blonde hair billows out in front of me like an elf princess from Lord of the Rings. Nearby, a woman gathers crops. Just as we clear the fields, it begins to pour with rain. Stranded, we take shelter at a nearby shop hut. The owner kindly brings us some plastic stools, and we sit and watch the rain beside an adorable little kitten. Kids and teens pop up from nowhere, buying cans of soda, sweets, crisps, chocolate. We sit quietly, people-watching, taking in their culture, listening to the dialect. The children are tanned and rosy, healthy and strong. Mountain life seems so conducive to overall wellbeing. The rain eventually dies down. Damp and muddy, we head back to the house. Lua prepares us huge bowls full of steaming noodle soup for lunch. Energy restored, we head back out again, just the three of us this time, with our raincoats. Karen winces as she puts her soaking wet shoes back on: "These feel absolutely rank.” She grimaces. “I’m squelching." We wander leisurely around the villages and market, talking to locals, joking, laughing, enjoying our time together. Mountain air feels so good against our skin. It feels wonderful to be somewhere new, unplugged, away from social media, cities, stress. Our bare, sleepy faces are plastered with relaxed grins. "This time last year, we were graduating," says Dominique, as we make our way back to May Kieu's. "And now, here we are on the other side of the world, together in this beautiful place. Crazy, eh?" We look at each other and laugh. Pretty crazy. Eventually, it’s time for us to head to the town. By morning, we'll be back in Hanoi with its armies of motorbikes and bustling city pavements. With sadness, we bid farewell to May Kieu’s family; three motorbikes await us outside. Lua hands me a helmet; I climb onto the bike behind him. Lua revs the engine once, twice, and then we're moving. We zoom over village bridges, and through puddles of mud. Small children wave earnestly as we pass, spreading goodwill to strangers they'll never meet again. 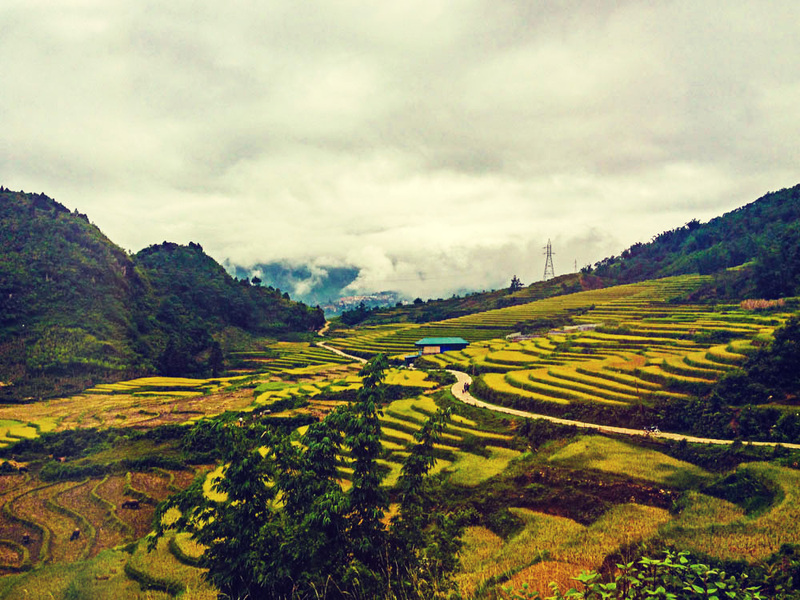 We weave between houses, mountains, trees and hills, leaving Sapa and its beauty behind us. The light begins to fade. Rolling hills of green, blue and brown blur in the valleys below. As we speed across the mountains, I think about Sapa being one of the most beautiful places I've ever visited. I’ve been to rice terraces before, but Sapa has its own spirit, a uniqueness beyond compare. I am infinitely glad that I came here, and that I came with Karen and Dominique. Night falls as we’re riding. Thick wisps of fog drift slowly across the inky skies. We speed steadily towards Hanoi. Our glowing red taillights dance like fireflies in the darkening distance.